The exotic and uncommon Delta Killifish makes a stunning addition to the dedicated aquarist's tank! The Delta Killifish Aphyosemion deltaense, also known as the Delta Killi, is extremely attractive.This beautiful killifish is a great addition to any advanced hobbyists collection. There are a few captive bred color varieties but it’s hard to improve on something that is naturally this colorful. The Delta Killifish pictured above is a wild caught male. The Delta Killifish is one of the killifish species from Africa that lives in swampy areas with various vegetation, roots, and bog woods. They feed on the larvae of insects and small aquatic insects and crustaceans. The waters of their swampy home may dry up completely during the dry seasons. For this reason, some people consider this to be an annual species. However they will live longer than one year if their home waters do not dry up completely. Its eggs are able to exist for extended periods out of the water, insuring the survival of future generations. Since this type of killifish is generally not long lived, they are best kept with the intention of breeding them. This fish is a bit demanding to keep, so the Delta Killi is not recommended for the casual hobbyist. They need clean water and are sensitive to changes in the pH. They are also a more short lived species, with a life span of between 1 to 2 years. However if an aquarist is up for the challenge they are an exciting fish to breed! The Delta Killifish was described by Radda in 1976. Originating in Africa, they are found in swamps located between the delta of the Niger River and the Warri region of Nigeria. Another common name it is known by is Delta Killi. These fish are known as annual fish because in Africa when the dry season comes and the waters dry up the fish dies. Aplocheilidae species feed off insect larvae, small aquatic insects, small crustaceans, and worms. The Delta Killi can live for 2 years if the water conditions do not deplete too much. The Delta Killifish are extremely attractive. The body is elongated with long broad well-developed fins, and round scales. The head is flattened on top and the mouth upturned, they have no barbels. Males are the most brightly colored. Their background color can variable, light greenish bluish or a tan to light brown. There are dark reddish spots running along the center of the body, forming a broken line that extends through the tail. Another dark reddish line runs horizontally through the bottom lobe of the tail fin. There can be lines or spots run diagonally through the upper lobe as well as spotting on the upper portion of the body. The horizontal lines are accented with edging in a lighter blue-green or cream. The fins and tail are orangish to orange-red and the dorsal fin can also have dark red spots. The coloring of the female is more subdued with fewer colored spots. Lifespan: 2 years - In nature these fish are considered annual fish and normally die when their waters dry up. But they will live longer than one year if their home waters do not dry up completely. This fish can be a bit demanding to house in a home aquarium. There water requirements are not always the easiest to keep up with. Unfortunately, these fish do not have a long lifespan, normally only living a year or two. 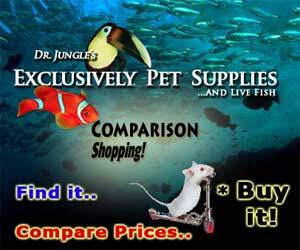 Provide these fish with good tank conditions and regular feeding you should be able to have a beautiful fish. The Delta Killifish are primarily carnivores, they feed on insect larvae, small aquatic insects, small crustaceans, and worms in the wild. In captivity they will eat most smaller sized fresh, frozen or dried foods but will look their best and will be more likely to breed if fed mostly live or frozen items. This fish is a bit demanding to keep so it is not recommended for the casual hobbyist. Because of their relatively short life span of 1 to 2 years, they are best suited for a single species tank that is setup with breeding in mind. If you succeed with breeding them, it would be fine to keep some of the excess males in a community tank so you can enjoy their bright colors. They will do fine in smaller tanks of only 5 to 10 gallons. For breeding, brackish water is suggested, at about 0.5%. Do this by adding 4 tsp. of salt for every 10 gallons of water (5 g/10 L). This fish needs clean water and are sensitive to h changes. A strong filter is needed for these fish to keep their water in pristine condition. Weekly water changes will help keep the aquarium in top condition and the fish healthy. Do regular weekly water changes of 30%. Water Changes: Weekly - Water change should be 30% weekly. 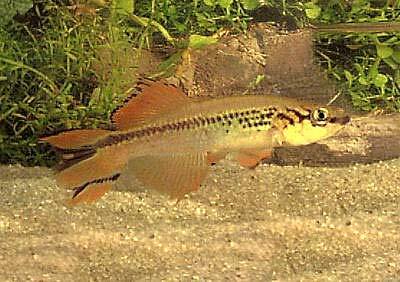 The Delta Killifish is a species that will swim in all parts of the aquarium. Because of their relatively short life span of 1 to 2 years, the The Delta Killifish are best suited for a single species tank that is setup with breeding in mind. If you succeed with breeding them, it would be fine to keep some of the excess males in a community tank so you can enjoy their bright colors. A community tank size of 20 gallons or larger is recommended if you plan on having more than one of this species. As with many fish, they will do best and are most effectively displayed in tanks which simulate their natural habitat. Include some driftwood and other hiding places for these fish and you will have a very happy fish. Provide good filtration and do regular water changes. A tight fitting lid is a necessity because this is a fish that likes to jump. For breeding they will do fine in smaller tanks of only 5 to 10 gallons. Brackish water with an addition of about 0.5% salt is suggested. Do this by adding 4 tsp. of salt for every 10 gallons of water (5 g/10 L). It is best to use a peat moss substrate for these fish. Water Region: All - This is a species that will swim in all parts of the aquarium. The Delta Killifish are not aggressive towards other species and can be housed in a community setting. Sometimes the Delta Killi males will fight with each other so the best setup would be one pair per tank. Because these are such short-lived fish it is usually recommended to keep them in single species tank with an eye towards breeding. Same species - conspecifics: Yes - Males will fight. Peaceful fish (): Monitor - They are safe as long as they won't in the Delta Killifish's mouth. Slow Swimmers & Eaters (): Monitor - They are safe as long as they won't in the Delta Killifish's mouth. Shrimps, Crabs, Snails: May be aggressive - Small crustaceans are a part of this species natural diet. The males are brightly colored. Females have little or no color, shorter fins and are usually about half the size of the males. The breeding tank for Delta Killifish should be a 5 to 10 gallon bare bottom tank filtered by a small sponge filter. Brackish water is suggested. The water temperature should be kept at a constant temperature between 75° and 78° F (24 - 25.5° C). Plants or spawning mops should be included but these are not for specific breeding purposes. They are there to give the female a place to occasionally hide and rest. The Delta Killifish is considered to be a substrate spawner. The best way to accomplish this is with a bowl filled with clean, untreated peat moss. The fish will dive into the peat to spawn. Once the eggs have been laid, remove the peat and dry it mostly but not completely on some newspaper. Then place the moss in a plastic bag, seal it and place the bag in a dark area that has a constant temperature of about 78° F (25.5° C). In 3 to 4 months, place the moss in a small tank containing clean water and the eggs should hatch in 1 to 4 days. Feed the young baby brine shrimp until they are big enough to handle larger foods. Delta Killifish are extremely hardy and disease is not usually a problem in a well maintained aquarium. These fish however are very prone to Velvet disease. That being said there is no guarantee that you won't have to deal with health problems or disease. They are primarily susceptible to velvet and bacterial infections if good water quality is not maintained. Anything you add to your tank can bring disease to your tank. Not only other fish but plants, substrate, and decorations can harbor bacteria. Take great care and make sure to properly clean or quaranteen anything that you add to an established tank so not to upset the balance. A good thing about Delta Killifish is that due to their resilience, an outbreak of disease can often be limited to just one or a few fishes if you deal with it at an early stage. When keeping more sensitive types of fish, it is common for all fishes to be infected even before the first warning signs can be noticed. The best way to proactively prevent disease is to give your Delta Killifish the proper environment and give them a well balanced diet. The closer to their natural habitat the less stress the fish will have, making them healthier and happy. A stressed fish is more likely to acquire disease. Delta Killifish are very resiliant. Yet it is recommended to read up on the common tank diseases. Knowing the signs and catching and treating them early makes a huge difference. For information about freshwater fish diseases and illnesses, see Aquarium Fish Diseases and Treatments. It may take some work to find this fish. A few Delta Killifish are wild collected but these numbers are relatively small. If your local fish store is not able to get some for you, try contacting your local killifish club. It is possible that some of their members may be breeding them.